Bloemsma & Van Breemen is a Dutch shipyard whose history began in 1974 when it built its first totally custom hull and when the yard was called Jachtwerf Bloemsma of Makkum. The company has built a total of 136 complete hulls in steel and aluminium, as much customised production for direct customers as for other shipyards. 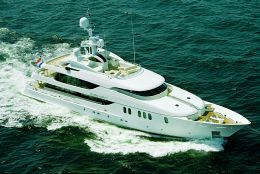 In 1997 the management deemed it opportune to exploit the yard's considerable experience and create complete yachts to be marketed with the company's new name which, in the same year, became Bloemsma & Van Breemen. 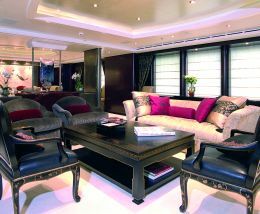 Exterior and interior design: Reymond Langton Design. For further information contact Bloemsma & van Breemen Shipyard, Strƒnwei 30, 8754 HA Makkum, Netherlands; tel. +31(0)515-231785; fax +31(0)515-231844; e-mail: werf@bloemsma-vanbreemen.nl; website: www.bloemsma-vanbreemen.nl. This industrial initiative however did not exclude the building of hulls and other works in steel and aluminium for third parties. The yard has built six classic style sailing yachts designed by Hoek Design, including the 80' Mulligan and the 74' Cpihue. The latter returned to the yard three years afterwards, following a circumnavigation and over 100.000 miles of sailing without any significant problems. The special nature of the materials favoured by the yard - steel and aluminium alloys - has meant that totally customised yachts could be built in accordance with even the most extravagant requirements of the owners who commissioned them. Among these we point out the 82' Hoek, a sailing yacht belonging to the increasingly varied category of racer/cruiser, and the 96' Vripack Doggerbank Offshore, a high performance motoryacht. One of the most distinctive aspects of Bloemsma & Van Breemen is large investment in research in order to offer large size yachts always in the avant-garde, especially with regard to safety and comfort under way. Moreover, this Dutch yard's experimentation is always aimed at the achievement of projects that express high performances: hulls deriving from in-depth technical research that is in continual evolution. 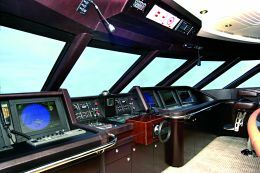 Undoubtedly this is a yard which, rather than drawing on design results obtained through research mainly in the commercial vessel sector, is itself capable of offering avant- garde solutions. In 2000 Bloemsma & Van Breemen acquired new production areas, thanks to which it can build yachts up to 65 metres. The current premises stand on an area of 20.000 square metres of which 5.500 are covered. Here we find craftsmen and equipment that can guarantee particularly accurate working of every element of the superyacht under construction. The two latest yachts completed by the yard are very different, bearing witness to high operational flexibility: the 90' Classic designed by De Vries Lentsch Design and the modern Flying Eagle which we intend to discuss in this article. 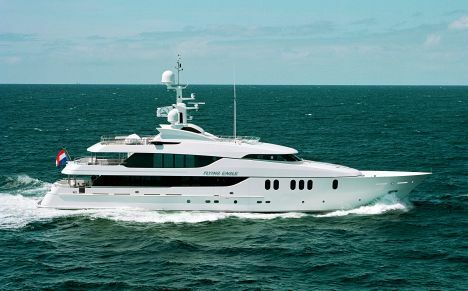 It's a modern 158 foot motoryacht, built in accordance with the owner's precise instructions. His requirements stimulated the activity of designers Andrew Langton and Pascale Reymond. To show the reader just how meticulously the owner supervised the design, we shall recount an anecdote told by the head of the yard. 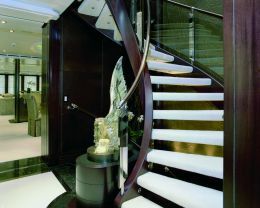 He came into contact with the owner of Flying Eagle in 2002 and, after presentation of the design, heard himself being asked where he intended to insert the yard's logo. 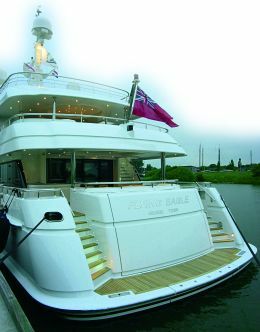 Of course an owner whose ideas are so clear greatly facilitates the yard's work, though in this case it was an owner who never delegated anyone for direct discussion of how each small detail of his yacht should be, from the technical to the aesthetic. Before describing the compartmentalisation of the four decks of Flying Eagle, we shall say that it is a displacement hull in steel with aluminium superstructure. This solution results in performances such as a maximum speed of 15.7 knots and a range of no less than 3.700 miles, all in the comfort that a displacement hull of this size can assure. As mentioned previously, there are four decks. The lower is the night zone, excepting the amidships and aft sections which are respectively occupied by an impressive engine room and a garage for one of the three tenders, an RIB to be precise. There are four guest cabins, three with low double beds and private bathroom with tub and shower cabin, and one with twin beds and private bathroom. Forward on the same deck are the crew's quarters where the cabins all have private bathrooms. There is also a mess and services. 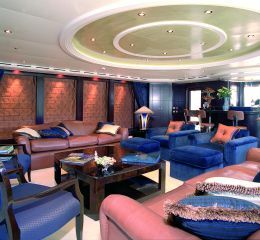 The main deck features an open area aft, completely sheltered by the prolongation of the deck above, where there is a sofa and two tables. 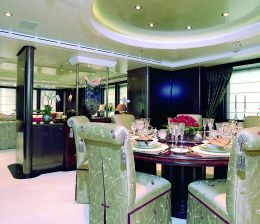 Inside the superstructure, the sofa area communicates with the dining area, the latter with a round table and, farther forward, a spacious galley and service rooms. 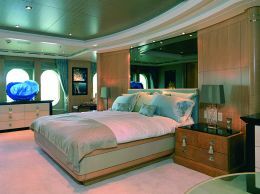 The forward area on this deck is wholly occupied by the owner's suite where we find an office complete with multimedia system, sofa and desk from which the cabin is directly accessed. This section being a wide body type structure, the cabin stretches the whole width of the hull. 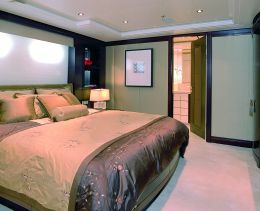 The owner's cabin has a central king size bed and, opposite it, a large plasma screen. On the left there is a relaxation area with armchairs and a small table. On the right there is a dressing table and access to the two wardrobe rooms and the large bathroom with separate toilets, central tub, shower cabin and double washbasin. Forward on the first upper deck, the great bridge is equipped with side windows for optimum visibility. This technical area communicates with the skipper's cabin on the same level and with an office. 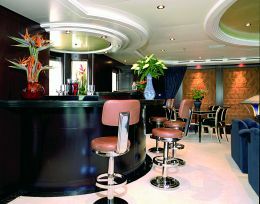 Aft of this zone there is a saloon with sofas, armchairs, coffee tables and a central bar, as well as a card table and the ever-present multimedia systems. Proceeding aft we come to the outdoor zone, partially sheltered by the prolongation of the deck above. There is a large table for open air meals, plus sofas at the sides and other relaxation accessories. The second upper deck is an actual "beach" in a dominant position. There are two sofas facing forward, with tables, and behind them moveable chaises longues with small tables and a great deal of space which, farther aft, is partially occupied by a large semicircular sofa with central table. Then the area for the tenders which can house two RIB's, handled by davits. This is indubitably an original design both for the compartmentalisation and the development of the lines which are soft and pleasing in spite of a full beam superstructure in the forward area. This aesthetic result was achieved by employing lines that link up in a very effective way, and above all by concentrating the volumes amidships and aft.